For many of us, winter can be a time in which eating habits are put on the back burner. With warmer temperatures right around the corner, there’s no better time that now to make some changes and spring into a healthier lifestyle. From creating well balanced meals and smart snacking, to making sure you’re getting enough exercise, making small changes can help us gain a little more control of our habits. Lifestyle expert Brooke Parkhurst will share tips to help you commit to a healthier routine. Whether you are trying to get back on track after falling off the resolution wagon, eat a more balanced diet, or increase your exercise routine, Brooke will help you achieve your springtime goals! IT STARTS AT HOME: The more you know how to use spices and aromatics, the fewer fats you require while cooking to make food taste delicious. Home cooks can cut down on butter and oils if the learn to add a dash of oregano and sauté garlic and onions. When it comes to tools, this is truly the start of a cooking revolution. The innovation in a Sharp’s Superheated Steam Countertop Oven is simple: steam can be hotter, cook better, and promote healthy living. The combination of steam superheated up to 485 degrees and conventional, radiant heat in all cooking modes means that your food will be crispy and browned on the outside, moist and delicious on the inside. This product is all about commitment to Simply Better Living. Developed for a modern, fast-paced, healthy lifestyle, the product is simple to use and requires no pre-heating and no defrosting - saving you valuable time. The pizzeria-style countertop oven cooks a straight-from-the-freezer, 12-inch pizza to crispy perfection, cooks everything from fish to frittatas, and it also rehydrates and revives leftovers. 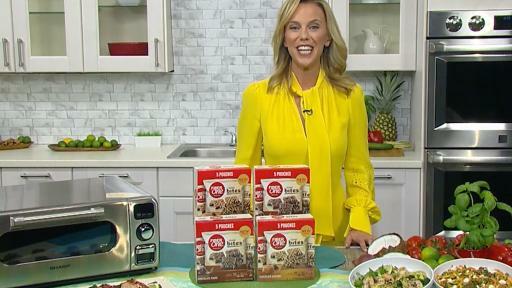 EAT HEALTHY ON THE GO: One of Brooke’s favorite new meals on the go is from Noodles & Company. They serve noodle dishes inspired by worldly flavors and just launched zucchini noodles. They’re the first fast-casual chain to do so nationwide! Made from fresh zucchinis spiralized in-house daily, a regular portion of zucchini noodles has 90 percent fewer calories and carbs than a regular portion of elbow noodles. Plus, they’re gluten-free and vegan! Zoodles are a great guilt-free swap and can be substituted for classic noodles in any dish or enjoyed in two featured dishes: Zucchini Romesco and Thai Green Curry with Shrimp. Visit any of Noodles’ 476 restaurants to try zucchini noodles today. SMART SNACKING SOLUTIONS: Strawberries, grapes, melon, bananas, pineapple and apples are always great for healthy “snacking” while Brooke prepares breakfast or dinner for the family. But for the perfect guilt-free indulgence to satisfy your sweet tooth in addition the added benefits of daily fiber her go to is Fiber One Brownie Bites. These brownie bites come in delicious flavors like Chocolate Fudge and Chocolate Carmel, and with 6+ bite sized brownies per pouch for just 130 calories, they’re perfectly-portioned for you when you want to satisfy your craving for a treat. They are the perfect addition to your snacking habits this Spring – and great for on the go. SEASONAL = FLAVORFUL- Eating seasonal is the only way to go. Fruits, vegetables and herbs taste their best when eaten at the peak of ripeness. They are more satisfying and therefore you eat a more moderate portion. Forget asparagus in February and watermelon in December- follow the seasons to eat smarter and better!